Introduction: Oral submucous fibrosis (OSMF), a precancerous condition, is highly prevalent in the Indian subcontinent. The current classification systems focus on either clinical and/or histopathologic features; hence, a need has arisen to formulate a staging system with emphasis on treatment strategies. Aims and Objectives: The objective of the study was to devise the staging system which is suggestive of treatment strategies based on the clinical and histopathological staging. Study Design: The study sample consisted of 100 OSMF patients categorized into clinical stages of Andrade and Khanna's staging system and histological grading of Andrade and Khanna's grading system. Thereafter, clinical features were reevaluated for modifying the Andrade and Khanna's staging system. Results: Based on the findings of the current study, certain clinical features were modified among all the stages of Andrade and Khanna's classification system for OSMF. Conclusion: The present study has devised a new staging system for OSMF with objective clinical and histopathological criteria which provide guidance for treatment plan. Introduction: Oral submucous fibrosis (OSMF), being a chronic insidious oral mucosal condition, affects most parts of the oral cavity and has a high malignant transformation rate, which is triggered by areca nut chewing, nutritional deficiencies, immunologic processes, and genetic predisposition. Aims and Objectives: The objective of the present study was to evaluate the levels of iron, as a trace element of patients with OSMF, and its association with areca nut and betel quid chewing. Materials and Methods: The study sample comprised 30 patients who were clinically diagnosed with OSMF and 10 healthy controls. OSMF patients were categorized by clinical staging. Tissue and serum estimation of iron levels was done using Vitros 250 photometry. 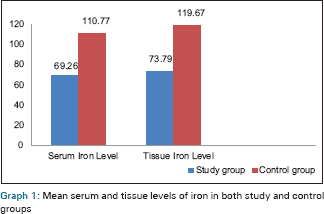 Results: The levels of tissue and serum iron was significantly decreased in OSMF patients when compared to controls, which was statistically significant. Conclusion: Most of the patients with OSMF chewed gutkha, as compared to the transitional form of pan masala. The betel quid and areca nut chewing habits are associated with the disease state, which may play a role in altering the tissue and serum iron levels. Introduction: Oral submucous fibrosis (OSF) has the highest malignant potential disorder than any other oral premalignant lesions. It is found in the Asian subcontinent, mostly India, Pakistan, Sri Lanka and Bangladesh. The understanding of the exact role of alkaloids and other etiological agents with respect to pathogenesis will help in the management and treatment modalities. Materials and Methods: A total of 1006 patients of OSF attending the dental outpatient clinic of the Department of Oral Medicine and Radiology over a period of 24 months were selected for the study. A detailed case history and clinical examination was done in visible light. The diagnosis of OSF was difficulty in opening the mouth and associated blanched oral mucosa, with palpable fibrous bands. Other diagnostic features included burning sensation, salivation, tongue protrusion, habits and associated malignant changes. Study was done on the basis of age group, habit duration, frequency of habit, and type of habit. Statistical Analysis Used: Simple correlation analysis was performed. Results: Of the 1006 cases of OSF studied, 422 (41.94%) cases were stage II. Two hundred and twenty six (22.29%) were stage IV, 184 (18.29%) stage III, and 174 (17.29%) stage I. 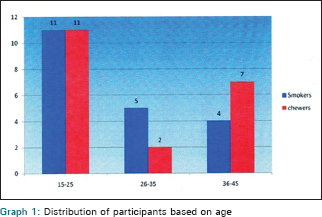 Among the groups divided based on age, Group II (20-30 years age) showed more prevalence than the others. Areca nut (gutkha) was a powerful etiological factor (60.43%) among other etiological factors. Conclusion: In the present study it was concluded that although the prevalence based on duration and frequency of habit was variable, it was found that most of the subjects were having stage II OSF and the severity was more in subjects who were chewing for longer duration and swallowing. Introduction: The use of tobacco and its products has increased in the population over the past two decades, resulting in considerable systemic exposure to nicotine. Aims and Objectives: To estimate and compare the serum nicotine levels among smokers and gutkha chewers, along with the effect of nicotine replacement therapy on serum nicotine levels between them. Materials and Methods: Forty individuals were selected and divided into two groups with 20 individuals in each group. First group included individuals with a smoking habit, whereas the second group included individuals with the habit of chewing gutkha exclusively. Four blood samples were collected from all the participants in both the groups and subjected to serum nicotine estimation. Two blood samples were obtained (first sample after 30 min and the next sample after 60 min following smoking/chewing) on the first day, and the other two were obtained after 24 h of tobacco abstinence (after 24 h all the participants were asked to chew nicotine chewing gums each containing 2 mg of nicotine). Statistical Analysis Used: The particulars of age, frequency of habit (smoking and chewing gutkha), and serum nicotine levels before and after replacement therapy (nicotine chewing gum) were recorded and analyzed statistically by cross-tabulation for calculation of mean and frequency. Results: The serum concentration of nicotine in smokers at 30 min after smoking ranged 120-309 ng/ml and at 60 min ranged 29-77 ng/ml. In group 1, individuals' serum nicotine concentration after replacement therapy with nicotine chewing gum ranged 29-77 ng/ml at 30 min and 1-6 ng/ml at 60 min. Serum concentration of nicotine at 30 min after chewing gutkha ranged 86-200 ng/ml and at 60 min ranged 61-102 ng/ml. The serum nicotine concentration in group 2 individuals at 30 min following chewing nicotine gum ranged 24-55 ng/ml and at 60 min ranged 0-3 ng/ml. Conclusion: Serum nicotine concentration in chewers was less at 30 min and 60 min after chewing gutkha compared to smokers. Serum concentration after replacement therapy in chewers was slightly reduced after 30 min and considerably reduced after 60 min of chewing nicotine gum compared to smokers, indicating that nicotine levels were more in smokers than chewers and replacement therapy is effective in chewers than in smokers. Aim: The purpose of this study was to evaluate the expression of cyclo-oxygenase-2 (COX-2) enzyme in the tissue samples of patients with various clinicopathological stages of oral leukoplakia and oral squamous cell carcinoma (OSCC). Materials and Methods: The samples for the study were divided into 4 groups. Group A comprised 20 healthy individuals with no habits. 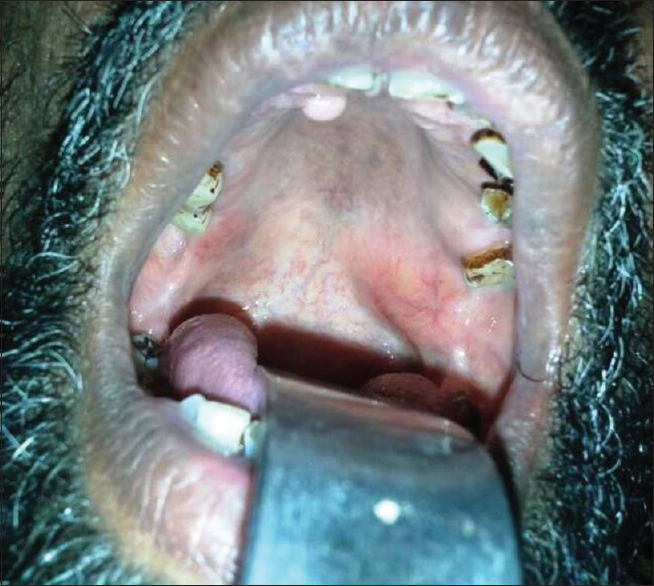 Twenty healthy individuals with habitual tobacco usage and no oral lesions were included in Group B. Twenty cases of leukoplakia diagnosed clinically and histopathologically were included in Group C. Staging was done using the modified classification and staging system of oral leukoplakia. Twenty cases of OSCC diagnosed clinically and histopathologically were included in Group D. Immunohistochemical staining was done on these 80 samples (paraffin blocks) for COX-2 expression by indirect method using polymer based Horseradish peroxidase system. Statistical analysis was performed using Kruskal-Wallis test and Spearman's rank correlation test. Results: Significant and proportional increase of COX-2 staining was noted with the increase in the severity of dysplasia. 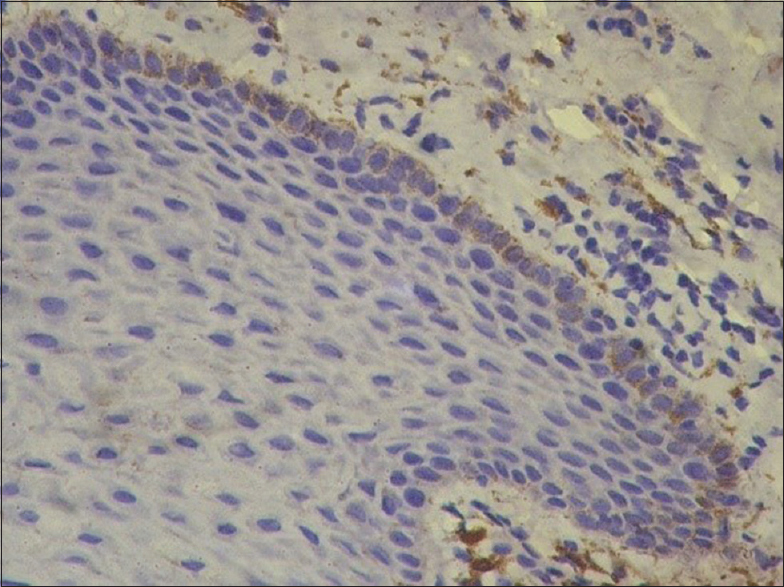 Eighty percent of OSCC expressed COX-2, increasing in its intensity of staining with the decrease in differentiation. Seventy five percent of leukoplakia showed positive COX-2 expression. Only 15% of positive controls were COX-2 positive. No normal mucosa showed positive expression of COX-2. Conclusion: High expression of COX-2 is seen in advanced stages of leukoplakia and OSCC. Hence, COX-2 enzyme increases cell proliferation, promotes angiogenesis and inhibits immune surveillance in carcinogenesis; it can be an early detection marker in oral leukoplakia and a prognostic marker of OSCC. Introduction: Cyclin D1 oncogene is a key regulator of cell cycle progression associated with various human malignancies. Aim: To establish the prognostic significance of cyclin D1 in oral squamous cell carcinoma (OSCC) and to correlate its association with clinicopathological parameters. 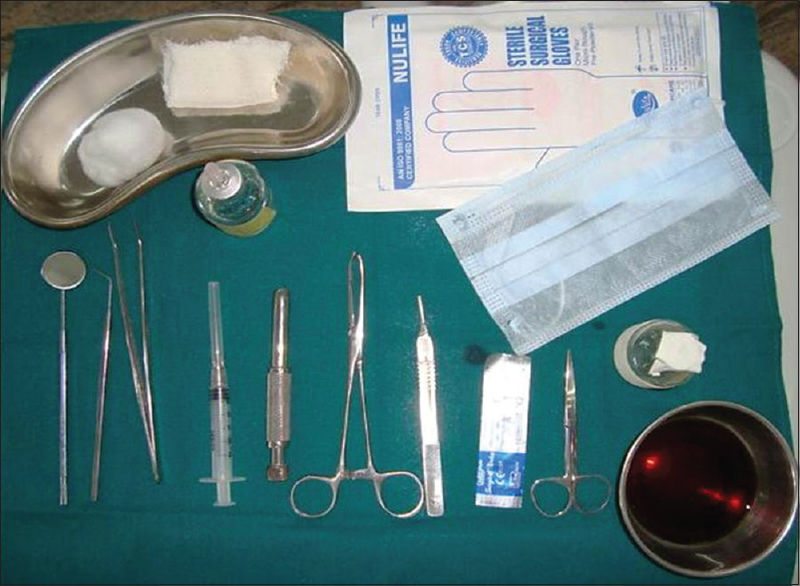 Materials and Methods: A retrospective study was carried out on 50 previously histopathologically diagnosed, formalin-fixed, paraffin embedded (FFPE) tissue samples of OSCC. 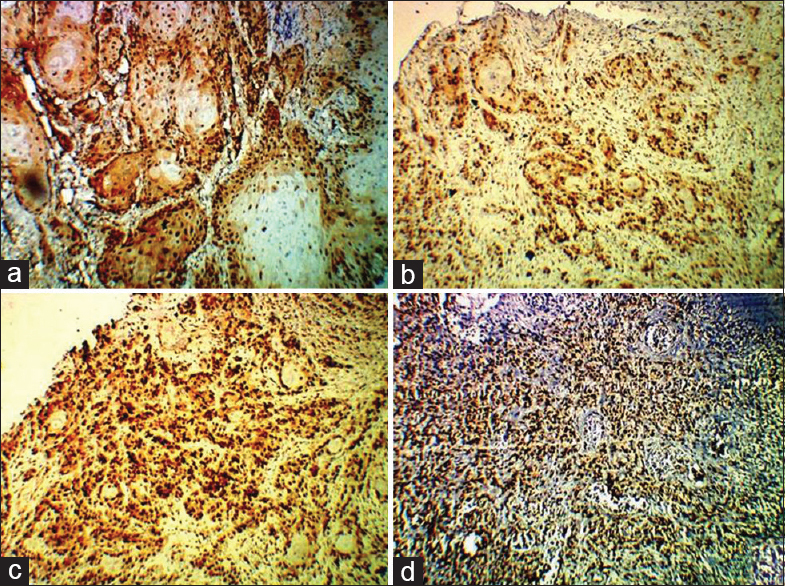 Immunohistochemical analysis was performed in 50 cases of different grades of OSCC using a commercially available monoclonal anti-cyclin D1 antibody. Statistical Analysis Used: All the compiled data was statistically analyzed using Chi-square and Mann-Whitney test. P values of <0.05 were considered to be significant. Results: Overexpression of cyclin D1 was seen in 68% cases of OSCC with a significant correlation with younger age group; no correlation was reported with respect to gender and site. The intergroup comparison of the cyclin D1 expression between well with poorly differentiated OSCC exhibited a significant correlation. Conclusions: The relative contribution of cyclin D1 expression in OSCC was significant according to the present study and further needs to be determined in large cohorts. Introduction: Third molars are the most common teeth that may follow an abortive eruption path and become impacted as a result of pathology, anatomical structures or insufficient osseous space posterior to the second molars. 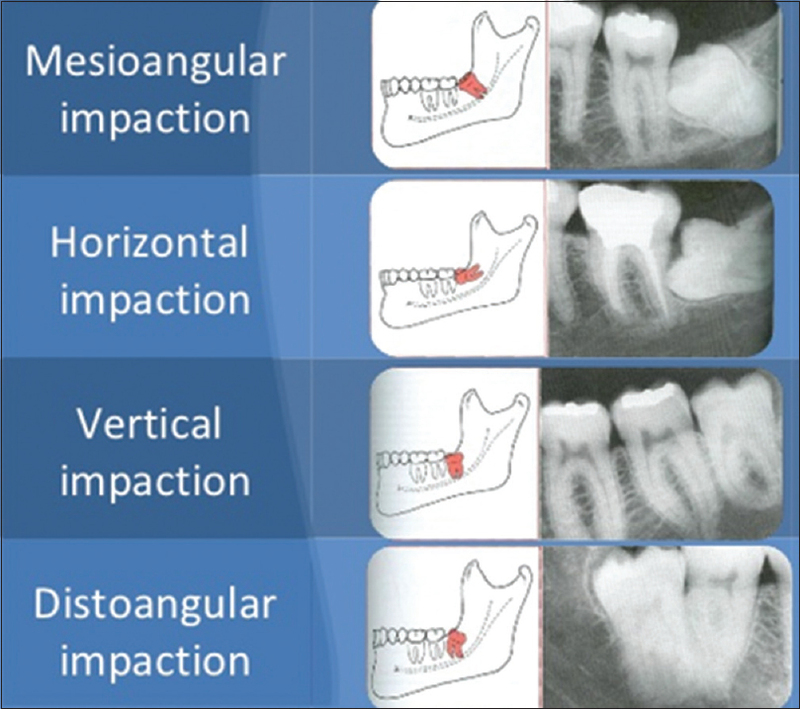 Aims and Objectives: The present study evaluated (1) the distribution of the impaction of mandibular third molar; (2) the distribution of the patterns of impaction radiographically; and (3) the gender distribution for pattern of impaction. Materials and Methods: This hospital-based retrospective study was conducted over a course of 6 months in the Department of Oral Medicine and Radiology and presents the analysis of 122 panoramic radiographs of patients between the age group of 18-30 years. They were interpreted and assessed for the impaction of mandibular third molars. Statistical analysis was done by Chi-square test. Results: Bilateral impaction of mandibular third molar is more common than unilateral in both the sexes, with mesioangular being the most common pattern. In males, mesioangular pattern was followed by horizontal, whereas in females it was followed by vertical. Conclusion: The present study provides useful data regarding the radiographic status of impacted mandibular third molars in patients. 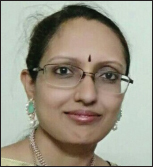 Danta Swasthya (oral health) is important for the general kausalya (well being) and relates to the quality of Jivana (life) that extends beyond the functions of the craniofacial complex. Danta Amivacatana (oral diseases) continues to be a major health problem worldwide. In mainstream Ausadha (medicine), new medical treatments are assumed to be ineffective, until they are proved to be useful. In addition, the adverse effects associated with mainstream medicine makes their use less desirable and less reliable by the population. Traditional medicine is a socioeconomic and sociocultural heritage, serving approximately 80% of the population of developing countries. Heterogeneity, easy availability, enduring recognition, popularity and fewer adverse side effects are some of the key lineaments of traditional Ausadha. This review attempts to introduce several widely used traditional medicines and plant extracts for treating oral diseases, with a highlight on tooth soap, one of the most unrevealed herbal alternative to tooth paste. One of the most important innovations in last few years is sialoendoscopy. The diagnosis and treatment of obstruction and inflammation of the salivary glands can be problematic because of the limitations of the standard imaging techniques. Sialoendoscopy is a new technique for evaluating salivary obstructive diseases, which allows complete visualization of the ductal system and its disorders. This procedure by allowing the complete exploration of the salivary ductal system is positioned to replace sialography and other radiological studies because of its higher specificity and cost effectiveness. 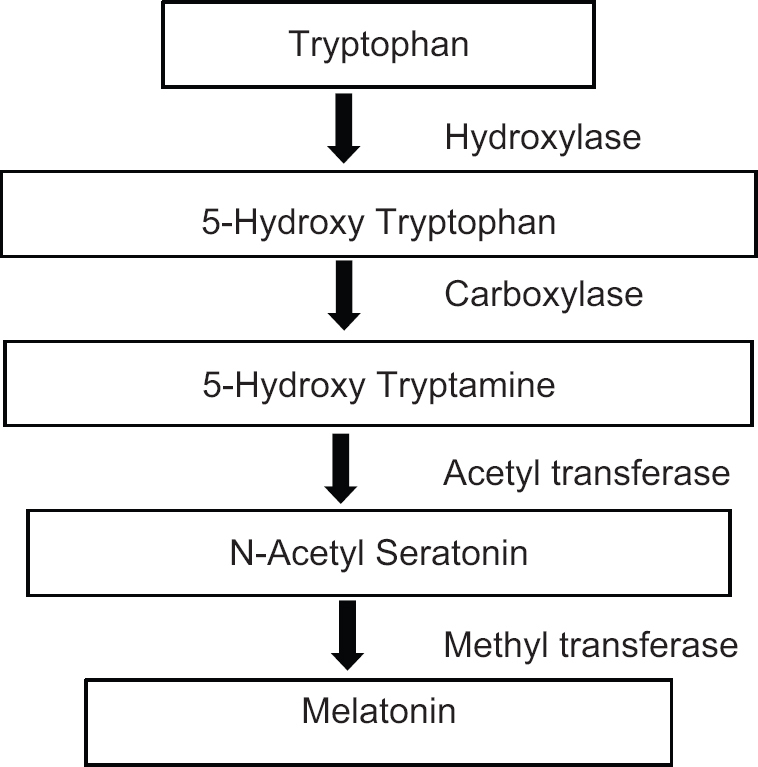 Melatonin (MLT) is a neuroendocrine hormone secreted mainly by the pineal gland. Recent studies have shown that it is also synthesized in various other parts of the body including salivary glands. The most significant effects of MLT are because of its potent antioxidant, antiageing, immunomodulatory, shielding and antineoplastic properties. Because of these effects, it might be used therapeutically in dentistry for the potentially malignant disorders, lesions of mechanical, bacterial, fungal or viral origin. It stimulates synthesis of collagen fibers and bone formation, and can be used in postsurgical wounds caused by tooth extractions, periodontal therapies, and dental implants. Thus, it is important for the dental clinicians to be familiar with the possible therapeutic uses of MLT in dentistry. The aim of the present article is to review related articles in the literature that have focused on MLT and its applications in dentistry and to provide a quick sketch of applications of MLT in dentistry for dental clinicians. Our review concludes that the research to date certainly offers valid applications of MLT in dentistry. Meanwhile, practical strategies with the highest success rates are needed for further interventions. The odontoameloblastoma (OA), also known as ameloblastic odontoma, is a very rare odontogenic tumor that is similar to ameloblastoma in its locally aggressive behavior. OA includes odontogenic ectomesenchyme in addition to odontogenic epithelium that resembles an ameloblastoma both in structure and in behavior. Its clinical presentation, however, often mimics the more innocuous odontoma, and hence, the recognition of its aggressive nature is commonly only ascertained after its histopathologic diagnosis following enucleation. This paper presents a rare case of OA with unusual clinical and radiological features. Till date cases reported elsewhere in the world regarding keratocystic odontogenic tumor transformation to squamous cell carcinoma are very sparse. It has been usually noticed in adult males, with the predominant location being posterior mandibular area. 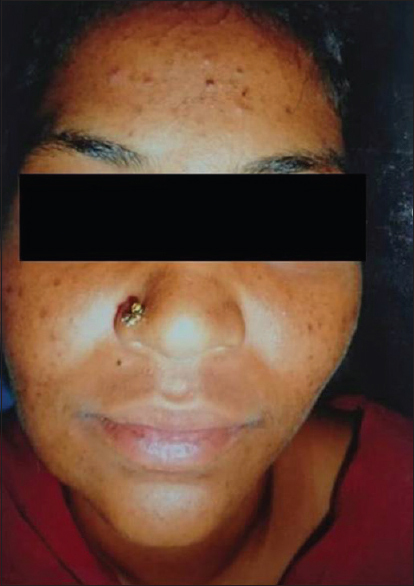 We hereby report a case of squamous cell carcinoma involving anterior mandibular area to posterior mandibular region in a 65-year-old female patient with no evidence of any ulceration and growth intraorally, suggesting that the tumor had a bony origin. Therefore, thorough monitoring of such tumours is necessary to arrive at a proper diagnosis, followed by providing treatment at the earliest. Sialolithiasis is an obstructive salivary disease due to salivary stone formation, also known as "meal time syndrome" because of its association with meal times, usually measuring less than 1 cm. However, occasionally giant sialoliths as large as 3 cm have been reported. Here, we report an interesting case of large intraductal sialolith of submandibular salivary gland in an old patient, with relevant radiological investigations and review of literature. Gunshot injuries are rather serious but uncommon type of trauma in India. Radiologists can contribute substantially in the evaluation and treatment of patients with gunshot wounds. Foreign bodies that enter a patient as a result of trauma are contaminated and produce a range of symptoms. Oral and maxillofacial gunshot injuries are usually fatal due to close proximity with vital structures. Here, we report a case in which radiographic evidence of foreign bodies in the right orofacial region exposed a history of a gunshot injury. The patient did not have any major complaints except for reduced mouth opening. These foreign bodies were clinically silent for approximately 12 years. Hemangiomas are well-known benign neoplasms of the body most commonly occurring in the head and neck region and less commonly in the oral cavity. The predominant site of occurrence, in the oral cavity, is lips followed by gingiva, tongue and palate. Treatment is primarily dependent on correct diagnosis of the lesion and its anatomic location. 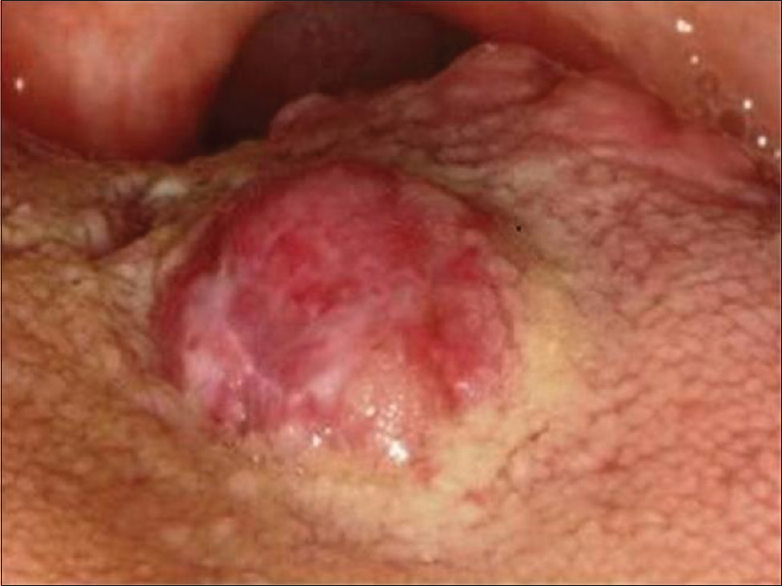 Here, we report a case of hemangioma on posterior third of the tongue in 34-year-old male patient, who was treated by sclerotherapy with sodium tetradecylsulphate (setrol) sclerosing agent. 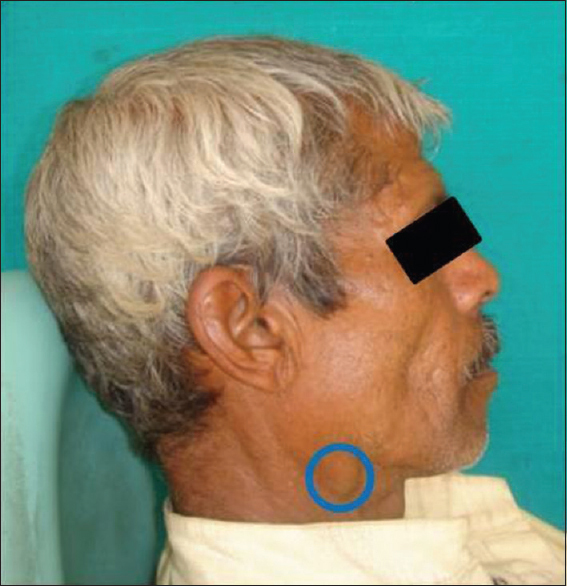 Pleomorphic adenoma of the submandibular gland is rare and can present difficulty in diagnosis. The heterogeneous histology, a possible malignant transformation, and an incomplete capsule that can determine a recurrence are the most important characteristics of pleomorphic adenoma. 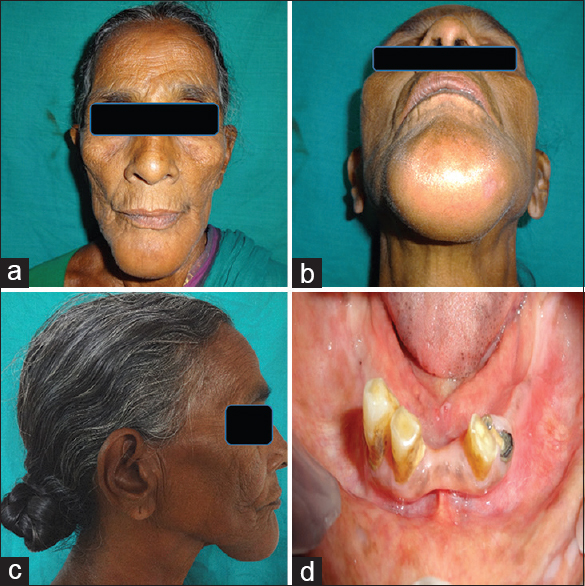 This paper illustrates one such atypical case resembling lymphadenopathy in the submandibular gland. Orofacial granulomatosis (OFG) is a rare disease, usually presenting as a persistent swelling of the soft tissues in the orofacial region, predominantly lips (cheilitis granulomatosa). The treatment of OFG can be challenging as frequent recurrences are very common. Here, we present a case of an Asian female patient with persistent swelling of the upper lip from the past 6 months. After establishing the diagnosis, intralesional triamcinolone injection (10 mg on a weekly schedule) was planned for a period of 6 weeks. Complete resolution of the lesion was observed. This article presents a unique case of cheilitis granulomatosa (CG) with a brief highlight on the various treatment modalities and a structured algorithm discussing the various differential diagnoses, aiding in formulating an accurate diagnosis and effective treatment. Ameloblastic fibroma, is a mixed odontogenic tumor, which commonly affects young children under the age of 20 years, with the mandibular premolar-molar region being the most common site of manifestation. 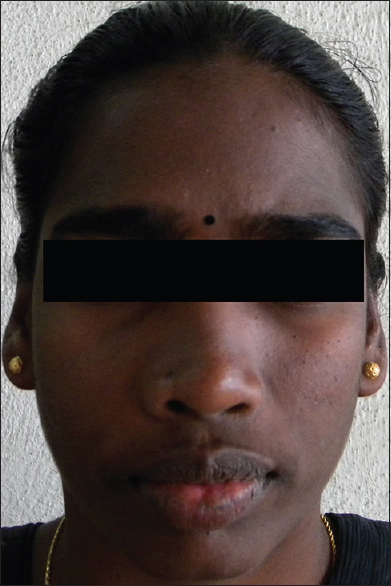 This is a case report of a 25-year-old female with a swelling in the right posterior mandibular region since 4 months, which was subsequently diagnosed as ameloblastic fibroma. Ewing's sarcoma represents a highly lethal and a rare malignancy, which predominately prevails in the long bones and skeleton. Its occurrence in the oral cavity has been estimated to be 1-2% of the overall reported cases. The common presentation of this malignancy overlaps with that of other malignant lesions affecting the jaws. Early diagnosis and treatment initiation improves the overall prognosis, even though the estimated survival rate is 5 years in approximately 4-7% of the patients following therapy. Treatment in concordance to other bone malignancies such as osteosarcoma and chondrosarcoma has been tried and is known to improve and prolong the survival rate. Here, we report a case of this rare malignancy occurring in the jaws with an unusual presentation as a common dental problem of an unhealed and infected extraction socket. Noonan syndrome is a clinically and genetically heterogeneous condition characterized by distinctive facial features, short stature, chest deformity, congenital heart diseases and other comorbidities. It is an autosomal dominant disorder with complete penetrance but variable expressivity. Until recently, diagnosis was based solely on clinical findings, however, genetic mutations responsible for Noonan syndrome, PTPN11 was identified on chromosome number 12 resulting in a gain of function of the nonreceptor protein tyrosine phosphatase SHP-2 protein in 61% of the patients with an estimated prevalence of 1 in 1000 to 1 in 2500 live births, which appears to be consistent worldwide. There are also evidences of autosomal recessive forms of Noonan syndrome. This is a case report of Noonan syndrome with a rare presentation of soft tissue cleft palate. Central hemangioma of the maxilla is a rare entity. Although the mucosal and soft tissue lesions are readily suspected due to their clinical appearance, the intrabony lesions may be difficult to distinguish visually. Early diagnosis of central hemangioma with appropriate and efficient diagnostic modality can help in the effective and more conservative management of the condition, eliminating the risk of hemorrhage following biopsy. Here, we present a case of central hemangioma of the maxilla emphasizing on various radiographic differential diagnosis with advanced imaging techniques. 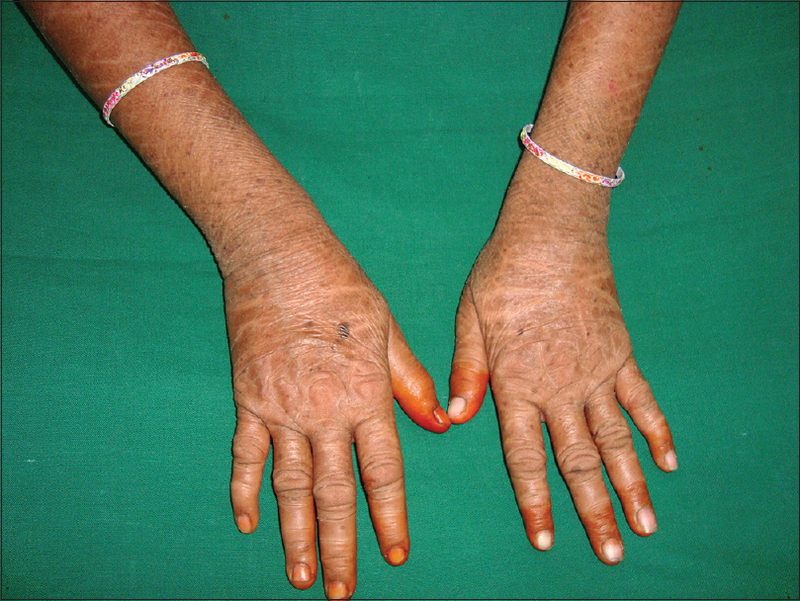 Solar elastosis is degenerative dermal disease of the photodamaged skin, associated with aging and influenced by hereditary factors such as pigmentation, exposure to sunlight and wind. The disease is characterized by the accumulation of abnormal elastic tissue in the dermis. 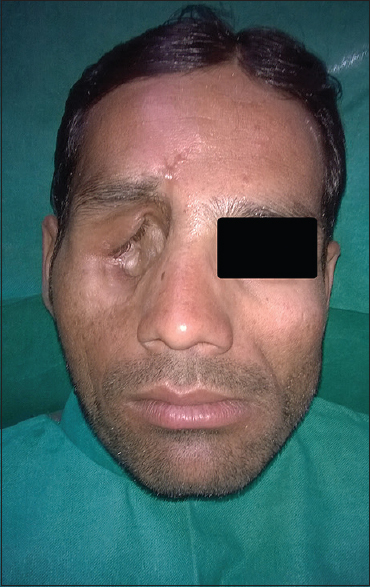 Solar elastotic syndromes include solar elastosis, Favre-Racouchot syndrome, elastotic nodules of the ears, collagenous and elastotic plaques of the hands, and colloid milia. The most common solar elastotic syndrome is solar elastosis. The chief etiological factors contributing to the lesion include chronic exposure to sunlight (ultraviolet, visible, and infrared radiation). Ultraviolet-A radiation causes erythema and its deep penetration into the dermis causes inexplicably chronic photodamage. Here, we present a case report of 32-year-old female with a distinctive clinical presentation. Hypertrichosis is a rare disorder that causes abnormal excessive body hair growth. Hypertrichosis has informally been called werewolf syndrome because the appearance is similar to that of a werewolf. It is often associated with additional anomalies including gingival hyperplasia, deafness, cardiomegaly and bone abnormalities. The association of gingival fibromatosis and a coarse facies could further worsen the esthetics. Thus, a multidisciplinary approach involving a psychologist, a dentist as well as a dermatologist would be mandatory. 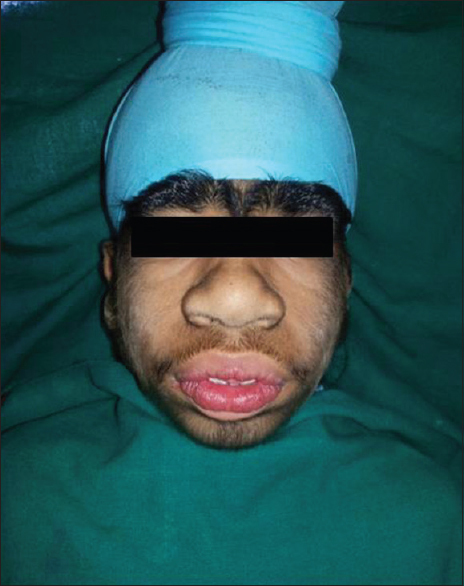 We present this rare syndrome describing a case of a 9-year-old boy with congenital hypertrichosis and gingival fibromatosis. 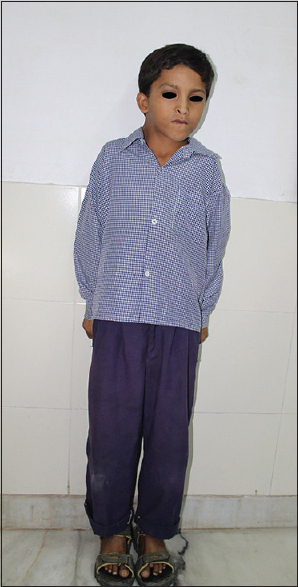 The growth being normal, the features of this boy were similar to hypertrichosis. Hypertrichosis has informally been called werewolf syndrome because the appearance is similar to the werewolf. 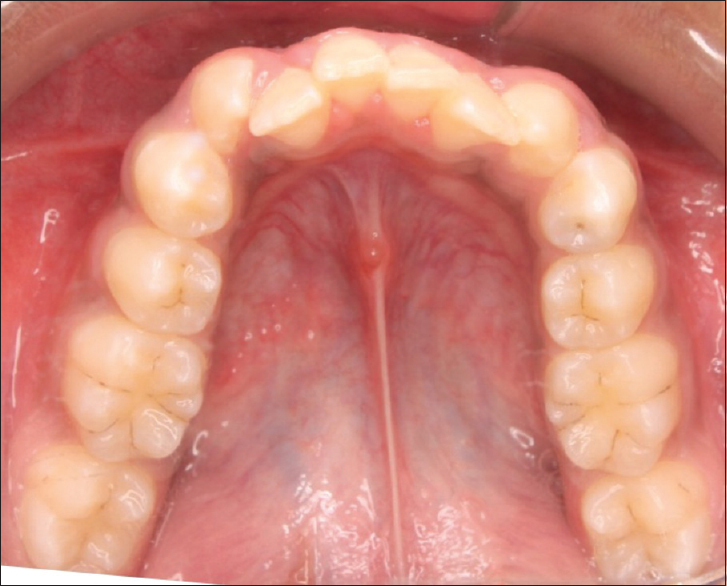 A non-ulcerated mucosal swelling on hard palate presents a challenge to the clinicians. Thorough clinical, radiographic and histopathological evaluations are mandatory. Here, we report a case of mucosal swelling on the hard palate of a 52-year-old male patient. On clinical examination, there was a dome-shaped, firm swelling seen on the left side of the posterior hard palate. On computed tomography (CT), the lesion appeared as round homogenously enhancing mass/lesion epicentered over the mucosa overlying the posterior part of the half of hard palate extending into the adjacent soft palate. When biopsy was performed, the histopathology report was suggestive of pleomorphic adenoma of palate. Pleomorphic adenoma is the most common tumor of the salivary glands; it accounts for approximately 60% of all salivary gland tumors. CT or magnetic resonance imaging should be considered when assessing for the presence of bony erosion or soft tissue and nerve involvement. Ultimately, complete surgical excision provides the definitive diagnosis and treatment for this noteworthy salivary gland neoplasm. Pleomorphic adenoma is commonly encountered in the parotid gland and other major salivary glands. At times they can also develop in minor salivary glands of the palate.